Secondary metabolism in Serratia sp. ATCC 39006 (Serratia 39006) is controlled via a complex network of regulators, including a LuxIR-type (SmaIR) quorum sensing (QS) system. Here we investigate the molecular mechanism by which phosphate limitation controls biosynthesis of two antibiotic secondary metabolites, prodigiosin and carbapenem, in Serratia 39006. We demonstrate that a mutation in the high affinity phosphate transporter pstSCAB-phoU, believed to mimic low phosphate conditions, causes upregulation of secondary metabolism and QS in Serratia 39006, via the PhoBR two-component system. Phosphate limitation also activated secondary metabolism and QS in Serratia 39006. In addition, a pstS mutation resulted in upregulation of rap. Rap, a putative SlyA/MarR-family transcriptional regulator, shares similarity with the global regulator RovA (regulator of virulence) from Yersina spp. and is an activator of secondary metabolism in Serratia 39006. We demonstrate that expression of rap, pigA-O (encoding the prodigiosin biosynthetic operon) and smaI are controlled via PhoBR in Serratia 39006. Phosphate limitation regulates secondary metabolism in Serratia 39006 via multiple inter-linked pathways, incorporating transcriptional control mediated by three important global regulators, PhoB, SmaR and Rap. Phosphate is an essential component of numerous biomolecules. Therefore, the control of intracellular phosphate concentrations is vital for bacterial survival. At least two major systems are involved in managing intracellular concentrations of inorganic orthophosphate (Pi), the preferred primary source of phosphate . When Pi is abundant, the low affinity Pit transporter appears to be primarily responsible for Pi uptake [2–4]. When Pi becomes limited, the high affinity Pst transport system (PstSCAB-PhoU) is activated, and takes over as the predominant Pi uptake system [5–8]. In Escherichia coli and other Enterobacteriaceae, the cellular response to Pi availability is mediated via the PhoBR two-component system. Under conditions of Pi limitation, the sensor histidine kinase PhoR is autophosphorylated . PhoR then activates its cognate response regulator, PhoB , which in turn activates expression of multiple genes, termed the Pho regulon, via direct binding to a conserved Pho box sequence found overlapping -35 regions in target gene promoters [10–12]. In E. coli, the Pho regulon is believed to consist of approximately 30 genes involved in the adaptation to survival under low Pi conditions, including pstSCAB-phoU and phoBR . Phosphate regulation is controlled via similar mechanisms in Bacillus subtilis and Streptomyces species, although the consensus Pho boxes are different in each system [13, 14]. Mutations in the pstSCAB-phoU operon result in constitutive activation of PhoR and hence, constitutive phosphorylation of PhoB [15, 16]. Therefore, pst mutants are proposed to mimic low Pi conditions. Pi has been found to negatively regulate the biosynthesis of antibiotics and other secondary metabolites in multiple bacterial species (reviewed in ). However, the complex molecular mechanisms underlying the Pi mediated regulation of secondary metabolism are not well characterised. In this study we investigate the role of the PhoBR two-component system, and Pi availability, on the regulation of antibiotic production in the Gram-negative Enterobacteriaceae, Serratia sp. ATCC 39006 (Serratia 39006). Serratia 39006 synthesises the red, tripyrrole antibiotic, prodigiosin (Pig; 2-methyl-3-pentyl-6-methoxyprodigiosin) . The natural physiological role of Pig in the producing organism may be as an antimicrobial agent . In addition, Pig is of clinical interest due to the observed anticancer and immunosuppressive properties of this compound [20–22]. Serratia 39006 also produces the β-lactam antibiotic, carbapenem (Car; 1-carbapen-2-em-3-carboxylic acid) [23, 24]. Both the Pig and Car biosynthetic gene clusters have been characterised (pigA-O and carA-H, respectively) [25, 26]. Production of secondary metabolites in Serratia 39006 is controlled by a hierarchial network of regulators . This includes a LuxIR-type quorum sensing (QS) system (SmaIR) [25, 28, 29], which allows gene expression to be regulated in response to cell density via the production and detection of low molecular weight signal molecules . In Serratia 39006, the N-acyl homoserine lactone (AHL) synthase SmaI produces two signalling molecules, N-butanoyl-L-homoserine lactone (BHL) and N-hexanoyl-L-homoserine lactone (HHL), with BHL being the major product . At low cell density, SmaR acts as a transcriptional repressor of target genes [28, 29]. At high cell density, and hence high BHL/HHL levels, SmaR binds BHL/HHL, resulting in decreased DNA-binding affinity with a consequent alleviation of repression. QS controls secondary metabolism in Serratia 39006 via at least four other regulatory genes (carR, pigQ, pigR and rap) [28, 29]. The putative SlyA/MarR-family transcriptional regulator, Rap (regulator of antibiotic and pigment), is an activator of Pig and Car production in Serratia 39006 . Rap shares similarity with the global transcriptional regulator RovA (r egulator o f v irulence) from Yersina spp. [32–34]. More than 20 additional genes have been shown to regulate secondary metabolism in Serratia 39006, and these are predicted to be responding to additional environmental stimuli [19, 27, 35, 36]. Previously, we demonstrated that, in Serratia 39006, mutations within genes predicted to encode homologues of the E. coli PstSCAB-PhoU phosphate transport system resulted in over-production of both Pig (10-fold) and Car (2-fold), at the level of transcription of the biosynthetic genes . In this study we investigate further the molecular mechanism by which these effects are occurring. We demonstrate that secondary metabolism in Serratia 39006 is upregulated in response to mutations in PstSCAB-PhoU or Pi limitation, via the PhoBR two-component system. In addition, we provide evidence that expression of the smaI, pigA and rap genes are activated via PhoBR in Serratia 39006. Hence, we propose a model in which Pi limitation increases secondary metabolism in Serratia 39006 via multiple, inter-linked pathways, incorporating the global transcriptional regulators PhoB, SmaR and Rap. Previously, Serratia 39006 mutants were identified which contained transposon insertions in regions sharing sequence similarity to the pstS and pstA genes from E. coli . DNA sequencing analysis of this region revealed that Serratia 39006 possesses a complete pstSCAB-phoU operon, the organisation of which is consistent with other enteric bacteria in which a pst operon has been identified (Fig. 1A). The Serratia 39006 Pst transporter is regulated via PhoBR.. A) The Serratia 39006 pstSCAB-phoU genes. (B) Putative Pho boxes found upstream of the pstS, phoB, pigA, smaI and rap genes in Serratia 39006. The E. coli Pho box consensus sequence is shown [10–12]. Conserved nucleotides are shown in bold. (C) β-Glucuronidase activity was assayed throughout growth in LB from a chromosomal pstC::uidA fusion in an otherwise WT background (NW201; diamonds and open bars) or a phoB mutant background (NW202; squares and solid bars). Bars represent β-glucuronidase assays and dashed lines represent bacterial growth. The Serratia 39006 pstS gene was predicted to encode a protein most similar to PstS from the enteric bacteria Erwinia carotovora ssp. atroseptica SCRI1043 (Eca 1043) (82% identity/90% similarity). The putative protein product encoded by pstC shared 90% identity and 95% similarity with PstC of Eca 1043. The pstA gene is predicted to encode a protein most similar to PstA of Eca 1043 (87% identity/92% similarity). The predicted protein encoded by pstB was most similar to PstB of Eca 1043 (88% identity/91% similarity). Finally, phoU was predicted to encode a protein most similar to PhoU of Eca 1043 (94% identity/98% similarity). Mutations in the pstSCAB-phoU operon are thought to mimic growth in limiting phosphate, and hence result in constitutive activation of the Pho regulon . We previously showed that Pig, Car and AHL production were increased in the pstS mutant . A possible explanation for this effect is that pigA, carA and smaI are regulated via the Serratia 39006 Pho regulon. Random transposon insertions in the phoBR operon were isolated based on their lack of hyperpigmentation when grown on Pi-limiting media. Growth on Pi-limiting media results in increased Pig production in the wild-type (WT; throughout this manuscript WT refers to the LacA parental strain) . Potential phoBR mutants were then checked for their loss of alkaline phosphatase activity (phoA, encoding alkaline phosphatase, is a conserved Pho regulon gene [1, 37]) and the sequence of the operon was determined, as described in Methods. The phoB gene was predicted to encode a 229 amino acid (aa) protein with highest similarity to PhoB from Eca 1043 (96% identity/98% similarity). The phoR gene was located 28 bp downstream of phoB, and was predicted to encode a 440 aa protein sharing the highest degree of similarity to Eca 1043 PhoR (87% identity/90% similarity). In E. coli, the pst operon is activated via direct binding of PhoB to a conserved Pho box upstream of pstS [10–12]. As Serratia 39006 is a member of the Enterobacteriaceae, we identified potential Pho boxes based on the E. coli consensus sequence. A potential Pho box was identified within the pstS promoter region of Serratia 39006, centred 122 bp upstream of the pstS start codon (Fig. 1B). This suggested that, as could be expected based on regulation of the pstSCAB-phoU genes in other bacteria, the pstSCAB-phoU genes in Serratia 39006 may be regulated by PhoB. A putative Pho box was also identified upstream of phoB (Fig 1B), centred 68 bp upstream of the phoB start codon, suggesting that phoBR may be auto-regulated via the putative Pho box. β-Glucuronidase activity produced from a chromosomal pstC::uidA transcriptional fusion was measured in the presence or absence of a secondary mutation in phoB. The pstC::uidA fusion strain does not contain a functional Pst transporter and is therefore believed to mimic low phosphate conditions. These data showed that, in the presence of functional PhoB, pstC was expressed constitutively throughout growth (Fig. 1C). Expression was dramatically reduced following inactivation of phoB, indicating that PhoB activates expression of the pst operon in Serratia 39006 (Fig. 1C). It was hypothesised that the upregulation of Pig, Car and QS in a Serratia 39006 pst mutant was mediated via the PhoBR two-component system. Assessment of Pig, Car and QS phenotypes in pstS, phoB and pstS, phoR double mutants confirmed that phoB and phoR were responsible for the upregulation of secondary metabolism in a pstS mutant background. The pstS mutant was increased for Pig (9-fold), Car (2-fold) and AHL (2.5-fold) production compared with the WT (Fig. 2). However, the pstS, phoB and pstS, phoR double mutants were restored to WT levels for Pig, Car and AHL production in LB (Fig. 2). Single phoB or phoR mutations had no effect on Pig, Car or AHL production (Fig. 2). As it has been previously shown that upregulation of Car in response to a pst mutation is mediated via the upregulation of QS , we focused on the effects on pigA and smaI expression for the remainder of this study. The effects of a pstS mutation on secondary metabolism and QS are occurring via PhoBR. (A) Pig, (B) Car and (C) AHL production were measured from WT, pstS mutant (ROP2), phoR mutant (BR1), phoB mutant (BR9), pstS, phoR double mutant (PCF60) and pstS, phoB double mutant (PCF59) cells. Production was assayed from cells grown to early stationary phase in LB. Phenotypic analysis showed that PhoBR are required for the upregulation of secondary metabolism and QS in response to mutation of the pstSCAB-phoU operon (described above). To confirm that these effects are exerted at the transcriptional level, primer extension analysis was used to assess levels of the pigA and smaI transcripts throughout growth in WT, pstS mutant and pstS, phoB double mutant strains. The abundance of pigA mRNA in the pstS, phoB double mutant was restored to levels similar to those displayed in WT Serratia 39006 (Fig. 3A). A chromosomal pigA::lacZ transcriptional fusion was used to confirm this result; a 3-fold increase in pigA transcription was observed in a pstS mutant, this was restored to WT levels following a secondary mutation in phoB or phoR (Fig. 3B). The upregulation of smaI transcription in the pstS mutant was also abolished by a phoB mutation (Fig. 3C). This is consistent with the hypothesis that PhoB, either directly or indirectly, activates expression of pigA and smaI in response to constitutive phosphorylation by PhoR as a result of the pstS insertion. A pstS mutation effects transcription of pigA and smaI via PhoBR. Primer extension analysis was used to measure the level of (A) pigA or (C) smaI transcripts in WT, pstS mutant (ROP2), or pstS, phoB (RBR9) double mutant strains throughout growth in LB. (B) β-Galactosidase activity was measured from a chromosomal pigA::lacZ fusion in an otherwise WT background (NW60), or in pstS (PCF76), phoR (PCF75), phoB (PCF74), pstS, phoR double (PCF78) or pstS, phoB double (PCF77) mutant backgrounds. Activity was assayed from cells grown to early stationary phase in LB. A complex network of regulators controls secondary metabolism in Serratia 39006 . Therefore, it was possible that the effects on Pig and AHL production, in response to a pst mutation, were mediated via one or more of these regulators. To test if the effect on smaI and pigA transcription was mediated through any of the known secondary metabolite regulators, the expression of chromosomal lacZ transcriptional fusions in pigP, pigQ, pigR, pigS, pigT, pigV, pigW, pigX, pigZ, rap and carR was assessed throughout growth in the presence or absence of a pstS::mini-Tn5 Sm/Sp insertion (data not shown). No effect was seen on any of the regulatory genes except for rap. The expression of rap was increased by 1.4-fold in the pstS mutant (Fig. 4A). Rap is a putative SlyA/MarR-family transcriptional regulator. As expression of rap is known to be regulated by QS , the effect of a pstC mutation on expression of a rap::lacZ transcriptional fusion was assessed in a smaI mutant background. A mutation within the pstSCAB-phoU operon was still able to activate rap transcription (1.5-fold increase), in the absence of functional smaI, indicating that this effect is via both QS -dependent and -independent pathways (Fig. 4B). Expression of rap is activated following mutation of the pstSCAB operon. β-Galactosidase activity was assayed throughout growth from a chromosomal rap::lacZ fusion in (A) an otherwise WT background (RAPL;diamonds and open bars) or a pstS mutant background (PCF45; squares and solid bars), or (B) a smaI (ISRL;diamonds and open bars) or pstC, smaI (TG71; squares and solid bars) mutant background. In both graphs, bars represent β-galactosidase assays and dashed lines represent bacterial growth. To investigate the control of the pigA, rap and smaI promoters in more detail, an E. coli plasmid-based system was used (described in Methods). β-Galactosidase activity was measured from E. coli strains carrying the pigA, rap or smaI promoters, inserted upstream of a promoterless lacZ gene (encoded by vectors pTA15, pTA14 or pTG27, respectively) in the presence or absence of Serratia 39006 PhoB, encoded by plasmid pTA74. Transcription from the pigA and rap promoters increased in the presence of pTA74, indicating that these genes may be activated by PhoB (Fig. 5). Unfortunately, the level of expression from the smaI promoter was negligible in this system (data not shown). Therefore, it was not possible to determine whether PhoB was modulating transcription from the smaI promoter. In the E. coli system, the degree of activation from both the pigA and rap promoters in the presence of PhoB is comparable with the levels of activation observed using chromosomal pigA::lacZ and rap::lacZ transcriptional fusions as a result of pstS/pstC mutation in Serratia 39006 (Fig. 3B & Fig. 4). Putative weak Pho boxes were identified within the promoter regions of pigA and smaI, overlapping the predicted -35 sequences and centred 28 bp and 34 bp, respectively, upstream of the transcriptional start sites, which were previously mapped by primer extension  (Fig. 1B). A putative weak Pho box was also identified within the rap promoter, centred 148 bp upstream of the rap start codon (Fig. 1B). The presence of putative Pho boxes suggest that PhoB may directly activate expression of pigA, smaI and rap, although this has not yet been shown experimentally. In the E. coli reporter assays described, it is possible that Serratia 39006 PhoB may show activity in the absence of the cognate Serratia 39006 histidine kinase, PhoR, due to cross-regulation by non-cognate E. coli histidine kinases, or as a result of low level activity of the unphosphorylated Serratia 39006 PhoB. In E. coli , Serratia 39006 PhoB can activate expression from the pigA and rap promoters. β-Galactosidase activity was measured from E. coli cells grown in LB carrying plasmid pTA15 or pTA14 (containing the pigA or rap promoters respectively cloned upstream of a promoterless lacZ gene) and either an empty vector control (pQE-80L) (solid bar) or pTA74, encoding PhoB (unfilled bar). In other species, PhoBR upregulates expression of multiple genes when the cell is starved for Pi . As Pi has been shown to control secondary metabolism in multiple species , we investigated whether secondary metabolism and QS in Serratia 39006 were also modified by Pi limitation. Growth of Serratia 39006 in phosphate-limiting medium (PL medium) without the addition of 5 mM KH2PO4 resulted in an increase in Pig (6-fold) and AHL (2-fold) production (Fig. 6A &6B), reminiscent of the effects of pstS mutations. β-Galactosidase activity from strains containing chromosomal pigA::lacZ, smaI::lacZ and rap::lacZ fusions grown in PL medium without the addition of 5 mM KH2PO4 was also assessed. Pi limitation resulted in increased transcription of pigA (2-fold) and smaI (5-fold) compared with Pi replete conditions (Fig. 7A &7B), although there was not a clear increase in rap transcription (Fig. 7C). 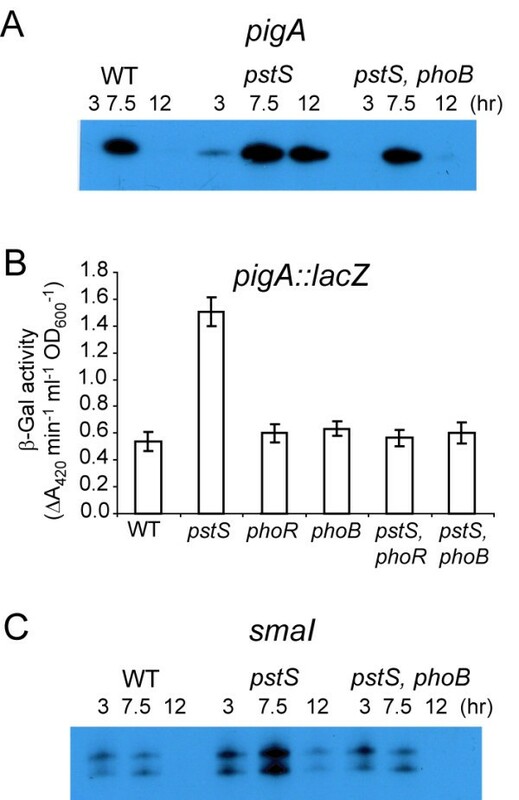 These experiments demonstrate that low Pi, like pstSCAB-phoU mutations, controls the transcription of pigA and smaI to up-regulate secondary metabolism and QS. However, in each instance, the fold increase in response to Pi limitation is lower (by approximately 35%) than that observed in a pst mutant. As the increase in rap transcription in a pst mutant is below 2-fold, a lesser change, in response to Pi limitation, may be below the level of detection. P i limitation affects secondary metabolism and QS. (A) Pig and (B) AHL production in WT cells were measured throughout growth in phosphate-limiting medium with (squares) or without (triangles) the addition of 5 mM KH2PO4. In all graphs, solid lines represent Pig or AHL assays and dashed lines represent bacterial growth. The effect of P i limitation on pigA , smaI and rap transcription. 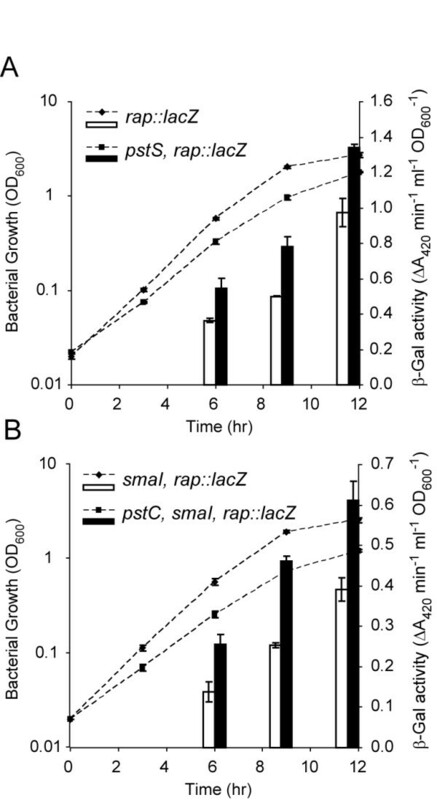 β-Galactosidase activity was measured from a chromosomal (A) pigA::lacZ (MCP2L), (B) smaI::lacZ (LC13) or (C) rap::lacZ (RAPL) strain throughout growth in phosphate-limiting medium with (squares) or without (triangles) the addition of 5 mM KH2PO4. In all graphs, solid lines represent β-galactosidase assays and dashed lines represent bacterial growth. We predicted that a pstS mutation would be epistatic to the effects of Pi on secondary metabolism and QS. In a pstS mutant, Pi limitation did not result in an increase in maximal Pig production (Fig. 8A), although slightly premature production of Pig was observed (data not shown). In addition, Pi limitation resulted in only a small (1.3-fold) increase in AHL production in a pstS mutant (Fig. 8B). Taken together, the data suggest that in Serratia 39006, as in other bacteria, mutation of pstS mimics the effect of Pi-limiting media. However, other mechanisms also appear to play a role, facilitating the small increase in AHL production observed in response to Pi limitation despite the absence of a functional PstSCAB-PhoU system. A pstS mutant is largely unresponsive to P i limitation. 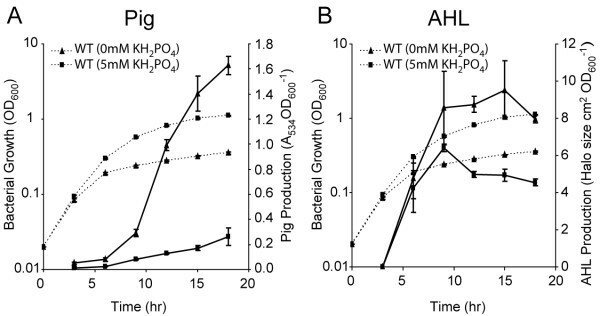 (A) Pig and (B) AHL production was measured from a pstS mutant (ROP2) grown to early stationary phase in phosphate-limiting medium with (open bars) or without (solid bars) the addition of 5 mM KH2PO4. There are multiple studies identifying environmental factors that effect Pig production in Serratia spp., including the effects of salt concentration, temperature, oxygen availability and multiple metal ion concentrations . However, the molecular mechanism underlying most of these responses has not been elucidated. Here, we investigate the molecular mechanism by which Pi limitation affects secondary metabolism in the enteric bacteria Serratia 39006. It was previously shown that a pstS mutation in Serratia 39006 resulted in the upregulation of QS and secondary metabolism . Here, we demonstrate that these effects are occurring via the PhoBR two-component system, since a secondary mutation in phoBR abolished the effects of a pstS mutation. In addition, we confirm that QS and secondary metabolism are upregulated in response to Pi limitation, and that this is occurring primarily via the PstSCAB-PhoU transport system. We also demonstrate that expression of rap is upregulated in response to a pstS mutation. Rap is an activator of Pig and Car, and a repressor of surfactant production and swarming motility, in Serratia 39006 [19, 29]. Rap shares similarity with the SlyA/MarR-family global transcription factor, RovA, which regulates genes required for host colonization in Yersinia spp. [32–34]. Therefore, our results indicate that three global transcriptional regulators, Rap, SmaR and PhoB, are involved in mediating the effects of Pi limitation on secondary metabolism in Serratia 39006. A mutation of the pstSCAB-phoU genes resulted in a clear increase in Pig and AHL production, and a clear increase in pigA, smaI and rap transcription. However, following Pi limitation, the effects on secondary metabolism and gene expression were less dramatic. The degree of activation of Pig and AHL production, and pigA transcription, was approximately 35% lower following Pi limitation than the levels of activation observed in a pstS mutant. In addition, a clear increase in rap transcription was not observed following Pi limitation. It is possible that this reduced effect is due to the fact that a pstS mutant is constitutively mimicking extreme Pi limitation. However, when WT cells are transferred to phosphate limiting media, there may be phosphate carry over from the initial inoculum, and the cells may utilise existing intracellular phosphate stores, for example inorganic polyphosphate, before phosphate starvation occurs. As the increase in rap transcription in a pstS mutant is below 2-fold, we believe that a 35% reduction in activation, in response to Pi limitation, may be undetectable. An alternative explanation could be that rap is induced via PhoBR, but not in response to Pi limitation. Previously, PhoBR has been shown to activate expression of the asr (acid shock RNA) gene, but Pi limitation did not activate asr expression . In addition, there is also evidence that PhoB can be activated by non-partner histidine kinases, in the absence of PhoR . This has lead to the hypothesis that PhoBR may activate genes in response to a variety of environmental cues, in addition to Pi limitation . It may not be entirely accurate to describe the effect of a pstS mutation, or Pi limitation, on QS as 'upregulation'. For QS to function correctly, it is the absolute concentrations of the AHL signal molecule that is critical, not the amount per cell . Due to the growth defect observed following a pstS mutation or Pi limitation, the amount of AHL per cell is increased, but the absolute value remains comparable to WT/Pi excess conditions. Therefore, it may be more accurate to state that the upregulation of smaI transcription, following pstS mutation or Pi limitation, allows maintenance of QS regulon control despite the reduced growth rate. This idea is supported by the fact that although carR, pigQ, pigR and rap are all regulated by QS in Serratia 39006 [28, 29], only rap transcription is upregulated in response to a pstS mutation. 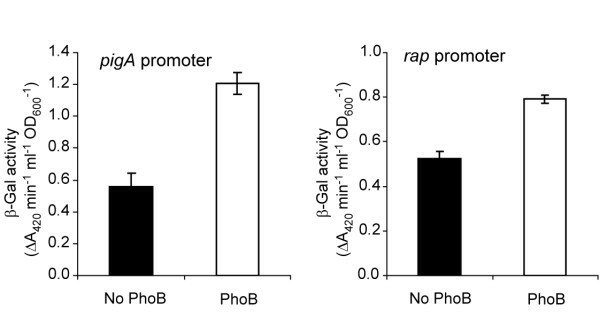 Our experiments indicate that, in response to a pst mutation, rap is activated independently of QS, and that activation may be mediated via PhoB. Activation of carA expression, following pstS mutation, was previously reported to be dependent on the upregulation of QS . However, as Rap is also an activator of carA transcription , it is possible that Rap, rather than QS, is responsible for the activation of carA following a pstS mutation. We propose that a dual mechanism, involving (1) the alleviation of SmaR repression at lower cell density, via upregulation of smaI, and (2) increased levels of Rap via PhoB mediated transcriptional activation, is responsible for the increase in carA expression following pstS mutation. In the absence of AHL (and hence constitutive SmaR repression), carA transcription is essentially abolished  and hence, further activation by Rap, in response to a pstS mutation, might not be possible. Based on our data, we propose a model by which Pi limitation results in upregulation of secondary metabolism via multiple inter-linked pathways (Fig. 9). In response to Pi limitation, or following mutation of the pstSCAB genes, PhoB is activated by phosphorylation [9, 15, 16]. PhoB~P can then activate expression of genes involved in the Serratia phosphate response which includes smaI, pigA and rap. Activation of pigA expression causes increased Pig production. Upregulation of smaI allows appropriate derepression by SmaR [28, 29]. This allows activation of pigA, carA and rap transcription. Rap, which is activated via QS and the phosphate response, can then further activate carA and pigA transcription. This results in upregulation of both Car and Pig production via multiple pathways. The proposed mechanism by P i limitation can upregulate secondary metabolism in Serratia 39006. In response to Pi limitation (or pstS mutation), PhoR activates PhoB by phosphorylation. 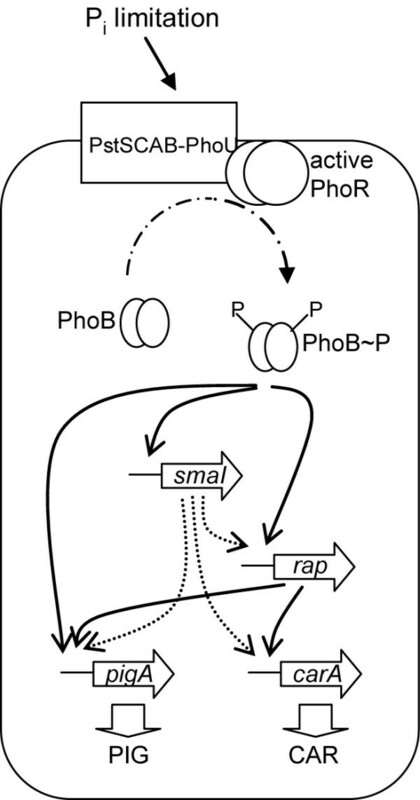 Active PhoB can then activate transcription of smaI, pigA and rap (indicated using solid arrows). Upregulation of smaI results in activation of the QS regulated genes (pigA, carA and rap), via AHL mediated SmaR derepression (indicated using dashed arrows). Rap then further activates carA and pigA expression (indicated using solid arrows). This results in upregulation of Pig and Car production. Multiple studies have linked Pi limitation to enhanced secondary metabolite production . However, the complex molecular mechanisms underlying phosphate-mediated regulation have proven difficult to elucidate. Extensive studies in Streptomyces species have shown that PhoPR (PhoBR) activates secondary metabolism in response to Pi limitation, including biosynthesis of undecylprodigiosin, a tripyrrole closely related to Pig [40, 41]. However, in Streptomyces, inactivation of PhoP or deletion of phoPR also activates secondary metabolism . In contrast, deletion of phoB and/or phoR in Serratia 39006 had no impact on secondary metabolism, demonstrating clear differences between the regulatory mechanisms employed by these distantly related bacteria. Although the requirement for increased secondary metabolism under conditions of phosphate limitation is unclear, it has been proposed that enhanced secondary metabolism allows the production of compounds which may, for example, directly antagonise other microorganisms or act as signalling molecules, thereby providing producing organisms with a competitive advantage under nutrient deprived conditions [40, 42, 43]. In conclusion, we have established that via the global transcriptional regulators PhoB, SmaR and Rap, multiple inter-linked pathways are acting to upregulate secondary metabolism in Serratia 39006 under conditions of Pi limitation, highlighting the importance of Pig and Car production under these conditions. Bacterial strains and plasmids are listed in Additional File 1[44–49]. Serratia sp. ATCC 39006 derivative strains were grown at 30°C and E. coli strains were grown at 37°C in Luria broth (LB; 5 g l-1 yeast extract, 10 g l-1 bacto tryptone and 5 g l-1 NaCl), minimal media (0.1% w/v (NH4)2SO4, 0.41 mM MgSO4, 0.2% w/v glucose, 40 mM K2HPO4, 14.7 mM KH2PO4, pH 6.9–7.1) or in phosphate limiting (PL) media (0.1% w/v (NH4)2SO4, 0.41 mM MgSO4, 0.2% w/v glucose, 0.1 M HEPES, pH 6.9–7.1 ± 5 mM KH2PO4) in shake flasks at 300 rpm, or on plates supplemented with 1.5% (w/v) agar (LBA). For the phoBR mutagenesis screen, Serratia 39006 was grown on PGM agar plates (5 g l-1 bacto peptone, 1% v/v glycerol and 1.5% w/v agar). Bacterial growth (OD600) was measured in a Unicam Heλios spectrophotometer at 600 nm. When required, media were supplemented with antibiotics at the following final concentrations; kanamycin 50 μg ml-1 (Km), spectinomycin 50 μg ml-1 (Sp), ampicillin 100 μg ml-1 (Ap), and tetracycline 35 μg ml-1 (Tc). The generalised transducing phage ϕOT8 was used for transduction of chromosomal mutations as described previously . All molecular biology techniques, unless stated otherwise, were performed by standard methods . Oligonucleotide primers were obtained from Sigma Genosys and are listed in Table 1. DNA sequencing was performed at the DNA Sequencing Facility, Department of Biochemistry, University of Cambridge, analysed using GCG (Genetics Computer Group, University of Wisconsin) and compared with GenBank DNA or non-redundant protein sequence databases using BLAST . Preliminary sequence analysis indicated the mini-Tn5 Sm/Sp insertions in strains ROP2 and KHC5 were in pstS and pstA respectively . To determine the full sequence of pstS and its surrounding genes, a Serratia 39006 Pst I sub-genomic library was created in pBluescript II KS+. One clone containing pstS was analysed further and was named pPST1. The pst region was sequenced via a 'primer walking' technique using primers PST1, PST2, PST3, PST4, PST5, PSTSLN, PSTSRN. To complete the pstSCAB-phoU operon, a 2.1 kbp region of pstSCA was PCR amplified with the primers NW244 and NW245, and then sequenced using primers NW244, NW245, NW246 and NW247. Random primed PCR was used to extend the phoU sequence obtained from primer walking of pPST1, as described previously . Gene specific primer NW250 was used in two separate random primed PCR reactions, one with PF106, PF107, PF108 , and a second with NW225, NW226, NW227. The products generated were then amplified with the nested primer PF109 or NW251, respectively and the resulting PCR products sequenced with primer NW251. To isolate phoBR mutants, Serratia 39006 strain LacA was subjected to a random transposon mutagenesis by conjugation with E. coli S17–1 λpir harbouring plasmid pUTmini-Tn5 Km1 as described previously . Ten thousand mutants were picked onto glucose minimal medium plates and replica-plated onto PGM agar Colonies that did not exhibit a hyper-pigmented phenotype were selected, based on the rationale that if hyper-pigmentation was not induced in response to Pi limitation, it might be due to an insertion in phoBR (strains BR1 and BR9 were isolated using this screen). The pstS::miniTn5Sm/Sp was transduced into non-Pi responsive mutants, and non-hyperpigmented mutants were then selected (strains RBR1 and RBR9 were selected following this screen). This suggested that these uncharacterised insertions had disrupted a regulatory element(s) common to pstS mutants and Pi limitation effects. The possibility that phoBR had been disrupted was investigated further by measuring alkaline phosphatase activity, encoded by phoA, which is a well conserved member of enteric Pho regulons . Mutants RBR1 and RBR9 did not produce elevated levels of alkaline phosphatase as observed in the pstS mutant (data not shown). Sequence analysis, described below, confirmed that the insertions in BR1 and BR9 were within phoR and phoB respectively. To determine the site of the transposon insertion in strain BR1, chromosomal DNA was digested with Eco RV and ligated into pBluescript II KS+. The ligation was used as template in a single-primer-site PCR using primers KML and KMR that anneal to the 5' and 3' ends of mini-Tn5 Km1 respectively in combination with primers T3 and T7. Sequencing of the resultant PCR products revealed that BR1 contained an insertion within a gene similar to phoR from E. coli. A further PCR using chromosomal DNA from the BR9 mutant with primers PHORL and PHORR (homologous to phoR 5' and 3' ends) and primers KML and KMR demonstrated that BR9 contained an insertion within a gene with similarity to phoB from E. coli. To further confirm the phoBR sequence, PCR products of phoB and phoR were generated with primer pairs PF154/PF155 and PF180/PF182 respectively and sequenced on both strands from independent products. A construct that enabled expression of native, untagged PhoB was created as outlined below. The phoB gene was amplified by PCR, using primers PF154 and PF155, which contain Eco RI and Hin dIII restriction sites, respectively. Additionally, primer PF154 contains a consensus ribosome-binding site (RBS, AGGAGGA). The PCR fragment of phoB was cloned into pQE-80L, previously digested with the enzymes Eco RI and Hin dIII. The resulting plasmid, pTA74, was confirmed by DNA sequencing. Expression of plasmid pTA74 in E. coli was induced with 1 mM IPTG. Plasmid pTA15 was constructed as described previously . The rap and smaI promoter regions were cloned into the promoterless lacZ plasmid pRW50  to give the plasmid constructs pTA14 and pTG27, respectively. Plasmid pTG27 was constructed by cloning an Eco RI/Hin dIII digested PCR product (generated using forward primer OTG124 and reverse primers OTG125) into Eco RI/Hin dIII digested pRW50. Plasmid pTA14 was constructed by cloning an Eco RI/Hin dIII digested PCR product (generated using forward primer PF43 and reverse primer PF42) into Eco RI/Hin dIII digested pRW50. All constructs were confirmed by DNA sequencing. Promoter activity assays were performed in E. coli DH5α cells as described in . Briefly, DH5α cells were transformed with the promoter::lacZ construct (pTA14, pTA15 or pTG27) and either pTA74 (encoding native PhoB) or the empty vector control, pQE-80L. The resulting strains were grown in LB containing Ap, Tc and 1 mM isopropyl-β-D-thiogalactopyranoside (IPTG). At late exponential phase, 1 ml samples were assayed for β-galactosidase activity. The assays for Pig and Car were performed as described previously . Pig production was plotted as (A534 ml-1 OD600-1). Detection of AHLs was performed using the Serratia LIS bioassay described in . β-Galactosidase activity was determined as described previously  and was represented as (ΔA420 min-1 ml-1 OD600-1). β-Glucuronidase activity was determined as for β-galactosidase activity except that reactions were performed in GUS buffer (50 mM NaPO4, 1 mM EDTA, 5 mM DTT, pH 7.0), using the substrate p-nitrophenyl β-glucuronide (PNPG; 10 mM), and measured at A405. β-Glucuronidase activity was represented as (ΔA405 min-1 ml-1 OD600-1). Alkaline phosphatase activity was assayed as described previously . Results presented are the mean ± the standard deviation of three independent experiments, unless stated otherwise. RNA was extracted from Serratia 39006 and primer extension analysis for the pigA and smaI transcripts was performed as described previously [28, 29]. All primer extension reactions were performed with 25 μg of total RNA and 0.2 pmol of the appropriate 32P-labelled primer. Oligonucleotide primers HS34 and HS36 were used in primer extension reactions for pigA and smaI respectively. We thank all members of the Salmond group for helpful discussions, I. Foulds for technical assistance and Corinna Richter for the identification of strain PCF58A9. This work was supported by the BBSRC, UK. TG and LE were supported by BBSRC studentships. TG drafted the manuscript, participated in design of the study and performed all experiments that are not credited to the additional authors, listed below. PF generated multiple strains (PCF# strains) and plasmids used in the study, participated in sequencing phoBR, participated in design of the study and critically reviewed the manuscript. LE isolated strains BR1 and BR9, performed primer extension analysis, participated in sequencing phoBR and pstSCAB-phoU, and participated in design of the study. NW generated strain NW201 and NW202, measured pstC::uidA expression and participated in sequencing of pstSCAB-phoU. GS conceived of the study and participated in the design and coordination of the study.